100% focused in Oil & Gas. From initially focusing on the trading of niche products for the Oil & Gas industries in Malaysia,today, we have grown to be leaders in the provision of comprehensive and diversified products & services to the energy industry in Malaysia and South East Asia. 5-Acres Fully Equipped Fabrication Facility. To be sensitive to the environment and conserve the state of the environment. To ensure highest standards in ethics and integrity are complied with. To sustain the highest Safety and Health standards and to ensure the Safety and Health of its employees are given the highest priority. To be very competitive in pricing, yet uncompromising in the quality and professionalism of work completed. 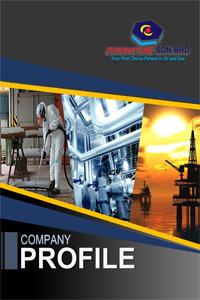 JURUNATURE is Your First Choice Partner in Oil & Gas with full compliance to all licensing and regulatory requirements. Adopting the "Malaysia Boleh" spirit and in collaboration with our worldwide renowned associates, JURUNATURE offers a service exceeding the expectation of our clients, in line with our objective of thinking globally and acting locally.